Bamberg Germany is a picturesque city in Upper Franconia (northern Bavaria) on the Regnitz river and the Main-Danube channel. 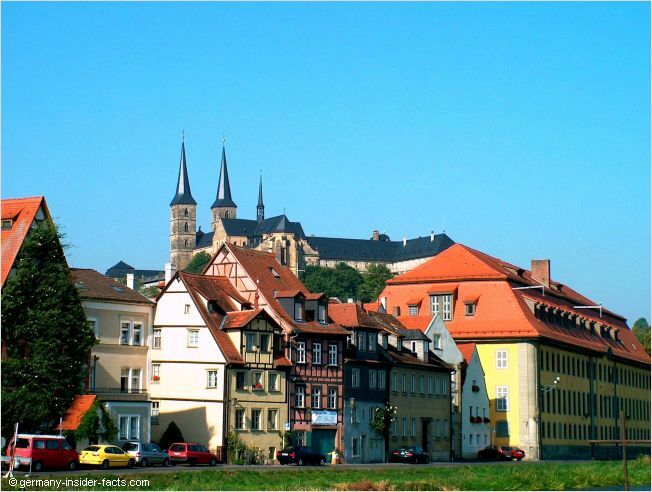 Known as Franconian Rome, Bamberg is built on seven hills, each hill is crowned with a church or a castle. The Old Town with its beautiful buildings of mixed architectural styles is well preserved. No wonder that Bamberg recieved the title of an UNESCO World Heritage Site in 1993. Whether you are interested in Bamberg's episcopal history, or you love a romantique place & German beer tradition, this beautiful town has many faces, and a lot of attractions for its visitors. Discover one of my favourite cities in Germany, enjoy the local hospitality and the unique culture. Use the quick links below to jump to any topic of interest. A "Castrum Babenberg" existed on the cathedral hill and was mentioned in 902 for the first time. King Heinrich II. founded a diocese in 1007. The first cathedral was consecrated in 1020 by Pope Benedict VIII. Heinrich II. also founded a Benedictine abbey on the Michaelsberg. King Heinrich and his wife Kunigunde chose Bamberg as their favourite residence, and they supported the diocese Bamberg with possessions. The royal couple was well educated and religious. In 1014 Henry was crowned Holy Roman Emperor by pope Benedict VIII. Emperor Henry II dies in 1024, and his wife empress Kunigunde in 1040. They were both canonised and are buried in the cathedral in their beloved Bamberg. The second bishop Suidger of Bamberg was elected as Pope Clemens II. in 1046. His las resting place in the Bamberg cathedral is the only preserved tomb of a pope north of the Alps. From the 13th century on bishops were also princes of the German Empire, overseeing the construction of major buildings in the city. Parallel the economical development of Bamberg increased. 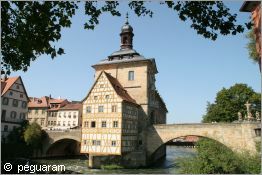 Bamberg has a long history in brewing beer, thus it is also known as the city of beer. Especially the dark "smokebeer" is famous around the world. 27 years before the German purity law (Deutsches Reinheitsgebot) was issued in 1516, prince-bishop Heinrich III. worried about the quality of beer, and ordered that nothing more than hop, malt and water should be in Bamberg's beer. At that time beer had already a long tradition in Bamberg. 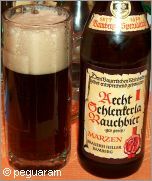 It is documented that bishop Otto I. granted the Benedictine monks at the St. Michael abbey the privilege of brewing beer. Today, ten private breweries still operate in Bamberg. 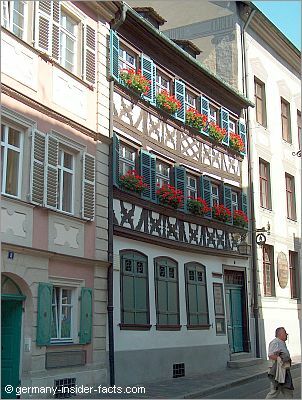 Many of them, like the "Schlenkerla", have their own unique pubs. Actually, the Schlenkerla (picture right) is my favourite pub in Bamberg, even if the smoked beer is not my cup of tea. But my husband loves it. The pub's authentic interior, the hospitality, and the delicious local food make it a must see place. Want to know where the name Schlenkerla comes from? Visit their website for an explanation . St Michaelsberg Chapel - The "heavenly garden"
Cathedral Hill - Domberg is the oldest settled hill and the episcopal centre with the cathedral (Bamberger Dom ) and the old and new residence. Michaelsberg - St Michaelsberg Abbey is a former Benedictine abbey, founded in 1015. As the monks were the first to brew beer, the Franconia Brewery Museum is now established in the old brewery. Kaulberg/Obere Pfarre - Liebfrauenkirche and the Karmelitenkirche are the two churches here. Stefansberg - Stefanskirche is the main protestant church in Bamberg. Jakobsberg - Jakobskirche is the second oldest church, built in romanesque style. It is a stopping point along the "Way of St. James" route. Altenburger Hill - Altenburger Berg (386m) is the highest of Bamberg's hills. Altenburg castle was the residence of bishops during the 14th and 15th century. Today you can spoil yourself in an excellent restaurant at the Altenburg. 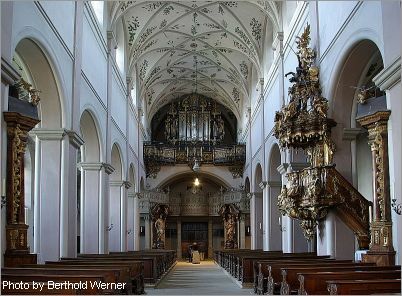 Abtsberg - in former times the Abtsberg belonged to the abbott of St. Michelsberg abbey, hence its name. Enjoy beautiful views over orchards and across the Ottobrunnen valley. The Dom with its four spires is an impressive sight. The first cathedral from 1012 burnt down, and was rebuilt in the 12th century. More changes to the cathedral happened in the 13th century to complete it to the late romanesque style you see today. Don't miss the graves of its founders, emporor Heinrich II. and his wife Kunigunde. Pope Clement II., who was a bishop of Bamberg before his papacy, has his resting place in the western choir of the cathedral. It is the only tomb of a pope outside France and Italy. The Bamberger Reiter (equestrian horseman) is a life-size statue in the cathedral at the north pillar of the St. George choir. Neither the artist, nor the person it represents is known. When you stand in front of the Dom on the cathedral place, look around, you'll see four different architectural styles. 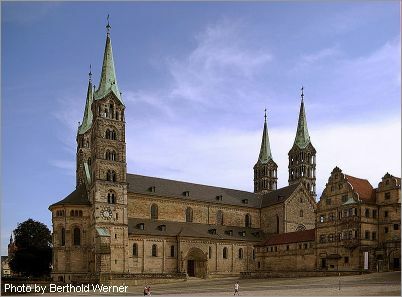 The Romanesque and Gothic (the 2 spires on the right) Dom, the Renaissance facade of the Alte Hofhaltung, and the Baroque ensemble of the New Residence (not in the picture). The Neue Residenz was the seat of the prince-bishops until 1802. The Emperor's Hall has 16 large wall paintings of emperors, the work of Melchior Steidl. The New Residence can be visited as part of a guided tour that includes the cathedral and old court. The beautiful rose garden in the inner court of the residence is open to the public. It is a wonderful place to sit and relax, to enjoy the magnificent roses and superb views over Bamberg. 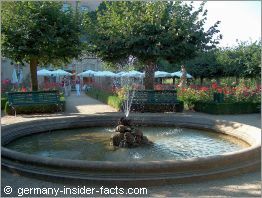 The garden was designed by Balthasar Neumann, the sculptures created by local artist. You won't believe it, the old town hall was built in the middle of the Regnitz river, between the upper and lower bridges. Actually, the upper bridge goes through the town hall. Legend has it that the bishop didn't give citizens of Bamberg the land to build a town hall. 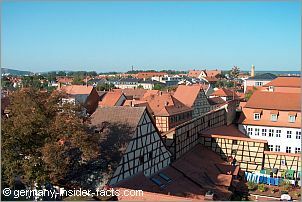 Therefore, they rammed huge wooden beams into the river bed, and built their town hall in the Regnitz. The location of the building marked the border between the espiscopal city on the hills and the island city of the ordinary people. The town hall is covered with beautiful frescoes in Baroque and Roccoco styles. 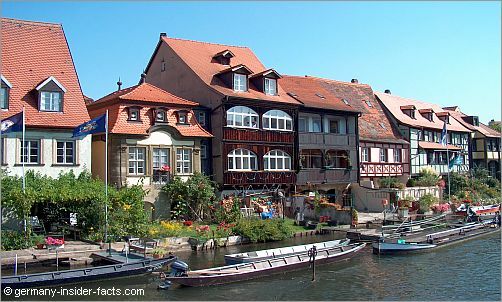 A picturesque row of fishermen houses along the Regnitz is the perl of Bamberg's island city. The lovely half-timbered houses can be best viewed when you take a boat tour. It is worthwhile. Bamberg is a paradise for all who love romantique Christmas markets. A medieval Christmas market is held in the old court while another large market is at Maxplatz. Christmas traditions come alive on the nativity trail. Discover more than 400 nativity scenes which are spread across 40 stations in Bamberg's old city, churches, museums, public buildings and the cathedral. The nativity scenes tell various biblical stories surrounding Advent. Read more about German Christmas markets. Now don't you long to visit Bamberg Germany? How to get to Bamberg? Getting to Bamberg by car is easy from everywhere in Germany. The motorways A 70 and A 73 have several exits north and east of the city. 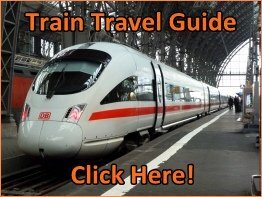 There are direct ICE train connections from Berlin and Munich every 2 hours, whereas coming from Frankfurt, you need to change trains in Würzburg. When you plan a visit it is a good idea to check out accommodation possibilities in advance. Read traveller reviews about Bamberg Hotels at Tripadvisor.